Type more with less effort on your iPhone or iPad! Expand custom keyboard shortcuts into frequently-used text snippets. Grab your favorite snippets from your Mac! Use the TextExpander custom keyboard to expand your snippets of text in Mail, Messages, Safari, and everywhere else. 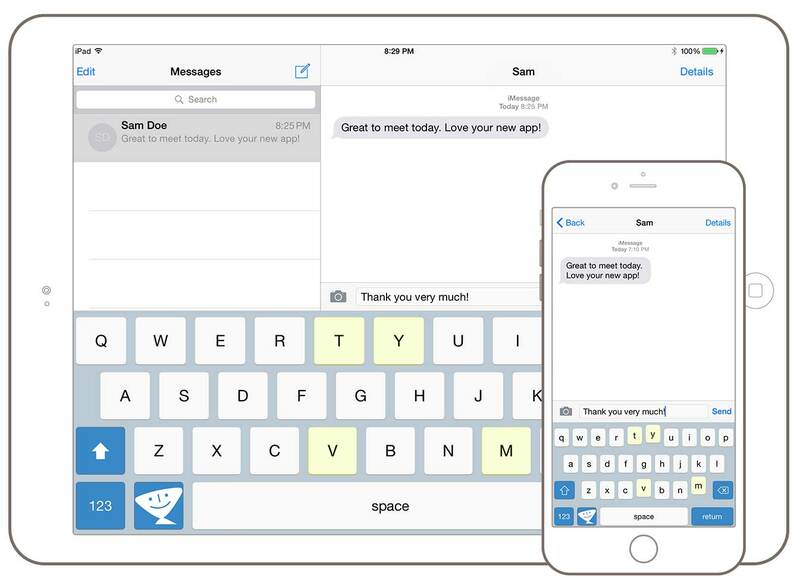 Many apps incorporate TextExpander integration. 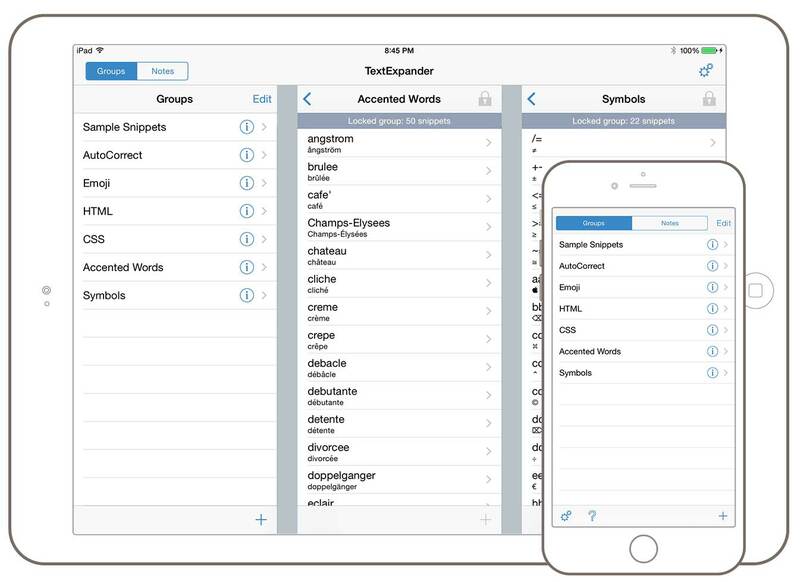 See the current list of TextExpander-enhanced iOS apps. 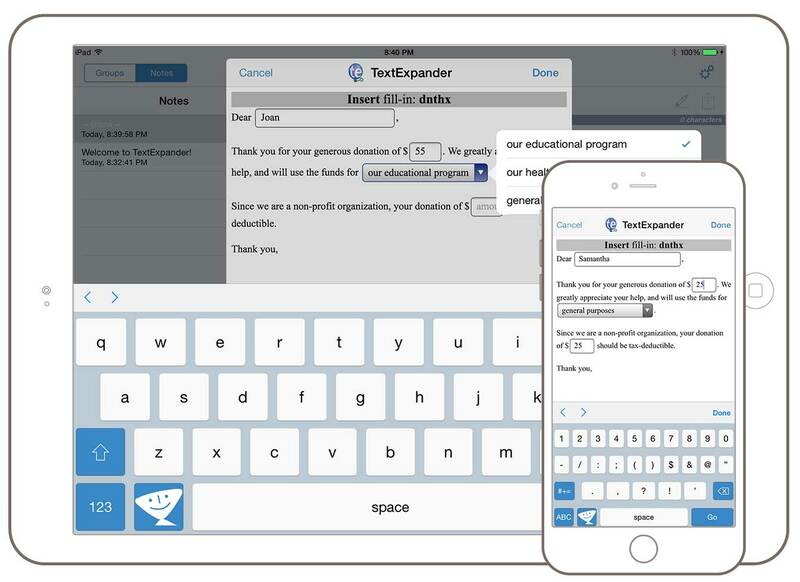 Compose new email in TextExpander, using your snippet library of frequently-used text, addresses and signatures, and boilerplate paragraphs, and send your mail right from the app. Many Twitter clients have built-in support for TextExpander. You can also compose Tweets and SMS messages in TextExpander and send them directly within the app. Save time and customize repetitive responses with fill-ins for single lines of text, multiple lines of text, popups, and optional text sections. Make responding a breeze. 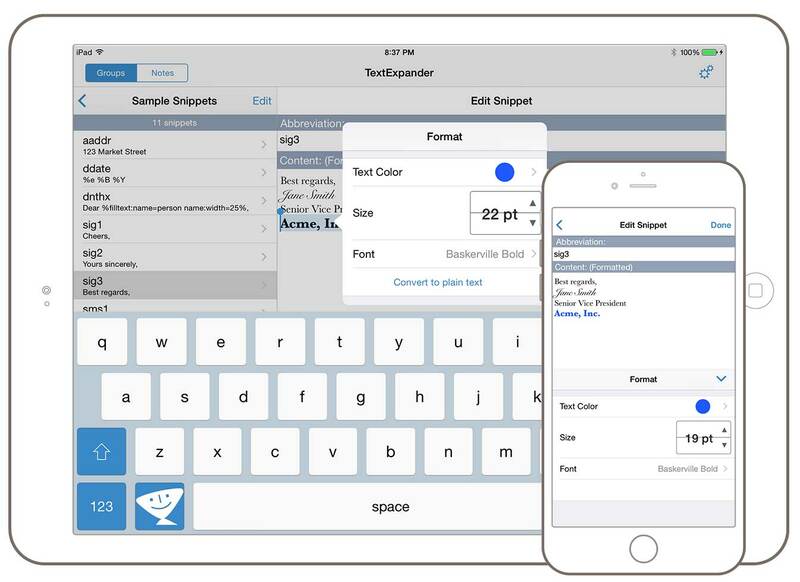 Expand custom keyboard shortcuts into frequently-used text snippets on your iPhone or iPad. Type faster on your iPhone/iPad/iPod touch using short abbreviations that expand into long snippets of text. Compose notes quickly and easily that contain frequently-used text like addresses, phone numbers, email signatures, URLs, etc. Use your snippets directly in many TextExpander-enhanced iOS apps. Add Predefined Groups such as emoji, accented words, symbols, and HTML/CSS. Sort snippets and organize groups via drag and drop. 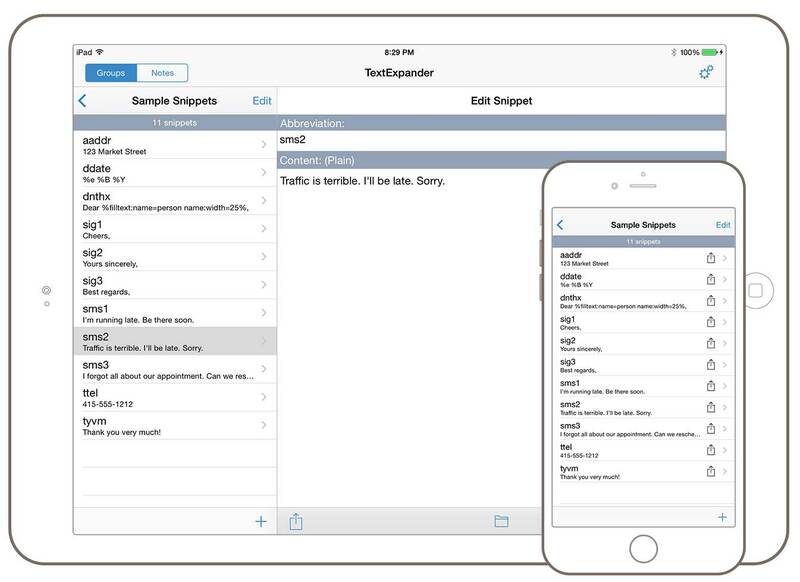 Create and use formatted text and plain text snippets in notes or when sending to email. Create “fill-in-the-blank” snippets including text fields and multiple choice popups to quickly customize a snippet upon expansion. Add macros to your snippet with the “Insert” menu to include things like the current date and time, clipboard contents, nesting of other snippets, and more. Sync your snippets using any folder of Dropbox or iCloud Drive, or import your snippet groups from your Mac via your local WiFi network. Share snippet groups with other iOS devices and Macs on your local WiFi network. Add snippet groups available online via URL. Automatically insert your notes into Mail, SMS and Twitter clients, or copy-and-paste messages into other apps on your iOS device.